Could high raw material prices cost the earth? An embarrassing hole has been blown in the recent celebrations marking 30 years of the Montreal Protocol. Only months after NASA confirmed the recovery of the ozone layer, delegates arrived at OEWG 40 (Open Ended Working Group 40th meeting)  in Vienna, to discuss reports of unexpected emissions of CFC-11 that could set the recovery back decades. The finger has been pointed at Asia, but mainly China, who is always sensitive to criticism. In a report published by the Environmental Investigation Agency, 18 Chinese companies admitted to using CFC-11 in polyol blends in PU systems used to produce rigid foams for insulation. China has taken rapid action but has so far found little to support the claims, urging various technical committees within the Protocol to investigate the matter and identify the sources. The increased emissions were first detected six years ago, but scientists needed to rule out atmospheric anomalies before making a watertight case. How could such widespread use go unnoticed? Those attending the meeting in Vienna were inevitably left with more questions than answers. This episode demonstrates the difficulty of implementing global policies, which put the environment up against profit, despite the Protocol’s Multilateral Fund to aid transition. The increased costs of all PU raw materials, more stringent environmental regulations, rising labour costs and the relentless demand for low-price goods has put extreme pressure on PU processors across the world. Globalisation of the PU raw material supply chain within the industry has effectively imposed first world cost structures on third world economies. 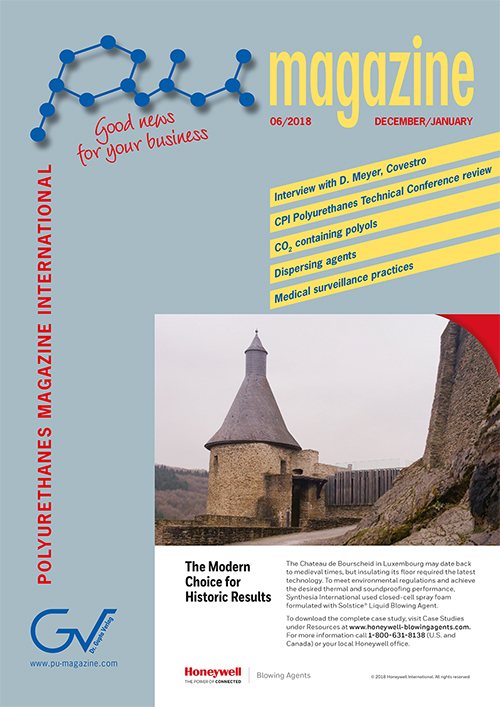 At a time when raw material suppliers are making record margins, the temptation for PU processors to use lower cost materials such as CFC-1 – arguably the best blowing agent for all PU foams – may be too great. PU processors across the globe are not alone in wanting to create environmentally sustainable businesses but it is only in rare cases that the benefit of adopting good practice comes back to those paying the cost. European companies having announced the elimination of PVC or unsustainable materials from their product ranges soon discover that the impact on their prices is too costly to implement. The PU industry was instrumental in driving the Montreal Protocol forward and developing viable alternatives to CFC-11. It could do more to help. Low cost products, for a highly competitive world can only be provided if the raw materials are priced appropriately. This opinion was submitted by industry experts who choose to remain anonymous. and invites further comments from interested readers. According to data collated by Labyrinth Research & Markets Ltd, on behalf of Europur, and presented at this year’s General Assembly of Europur and Euro-Moulders from 11 – 13 April 2018 in Krakow, Poland, the total production of flexible polyurethane foam in the 28 EU member states, Norway, Switzerland, Albania, Belarus, Bosnia, Kazakhstan, Kosovo, ­Serbia, Macedonia, Ukraine, Russia, and Turkey reached nearly 1.8 million t in 2017, of which 410,000 t was moulded and 1,374,000 t was slabstock. The 61st annual Polyurethanes Technical Conference, hosted by the Center for the Polyurethanes Industry (CPI) of the American Chemistry Council (ACC), comes to the Atlanta Marriott Marquis in Atlanta, GA, USA, from 1 – 3 October 2018. As the longest-running polyurethanes conference in North America, the event convenes technical experts, industry leaders, and downstream users for a unique convergence of scientific presentations, professional networking, and regulatory insight. More than 200 international companies including machinery suppliers, systems houses, technical consultancies and test laboratories exhibited at the triennial Utech Europe that took place as usual at the MECC, Maastricht, the Netherlands, from 29 – 31 May 2018. The event is a platform for companies to present their polyurethane technology and innovations to buyers and opinion leaders from all over the world. The number of participants grew by 13 % to 5,239 and the total number of visitors reached 10,113. Visitors came from all over Europe and no less than 90 different countries worldwide. 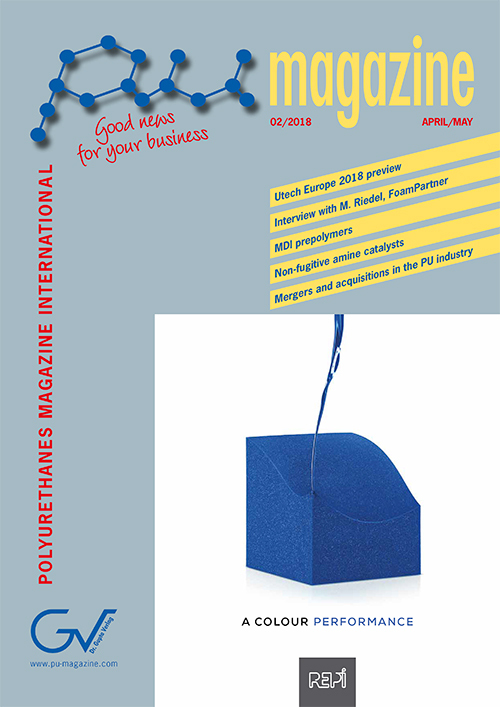 The international exhibition for polyurethane solutions, PSE Europe 2019, will take place from 26 – 28 March 2019 at the MOC Veranstaltungscenter München in Munich, Germany. A total of 75 exhibitors from 16 different countries as well as 1,069 trade visitors from 51 nations came to the successful launch of the trade show in 2017. According to the organiser, Mack Brooks Exhibitions Ltd, topics such as sustainability and energy efficiency have become top priorities in forward thinking companies. 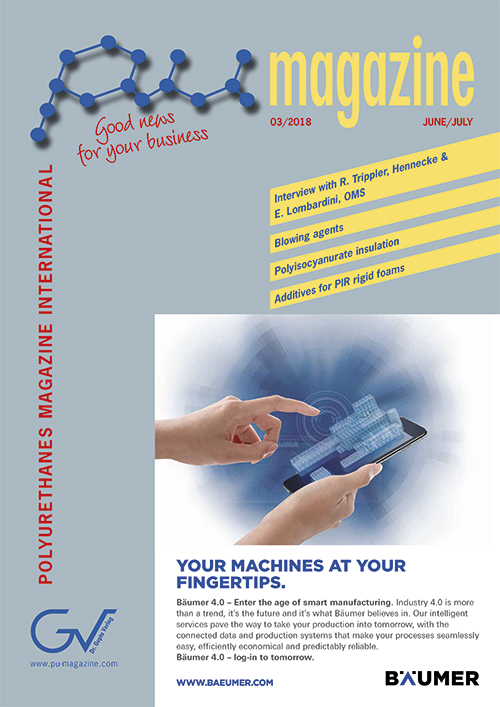 The application of polyurethanes as an alternative material is a key driver for innovative manufacturing methods in these businesses. In 2019, the second edition of the specialised trade show PSE Europe will again showcase innovations and solutions for the rapidly expanding world of polyurethanes. Already for the seventh time the shoe machinery manufacturer Desma invites to its house fair on 19 – 20 September 2018 at its headquarters in Achim, Germany. In addition to 50 co-­exhibitors from the supply industry, Desma expects more than 700 trade visitors to attend. Software solutions, processing technologies, automation tools, and customised shoes in the mass production segment are some of the topics that will take centre stage at the event. The extraordinary history of the KraussMaffei Group reaches back 180 years to the beginnings of German industry. Over time, the locomotive builders Maffei and Krauss evolved into a manufacturer of buses, tracked vehicles and machines. Today, the KraussMaffei Group with its three brands KraussMaffei, KraussMaffei Berstorff and Netstal is one of the globally leading manufacturers of machines for processing plastics and rubber. Reaction Process Machinery, a part of KraussMaffei, also has a reason to celebrate this year: founded in 1968, Reaction Process Machinery celebrates its 50th anniversary. While the festivities were going on at the headquarters in Munich, we had the opportunity to talk to Nicolas Beyl, President of the Reaction Process Machinery segment of the KraussMaffei Group, and to discuss with him the past 50 years and his opinion on the future of Reaction Process Machinery at KraussMaffei. Since January 2018 the Thermoplastic Polyurethanes (TPU) business within Covestro is under new leadership. Dr. Thomas Roemer has taken over the responsibilities of Marius Wirtz, who changed to the position of Senior Vice President, PUR Commercial Operations APAC at Covestro. 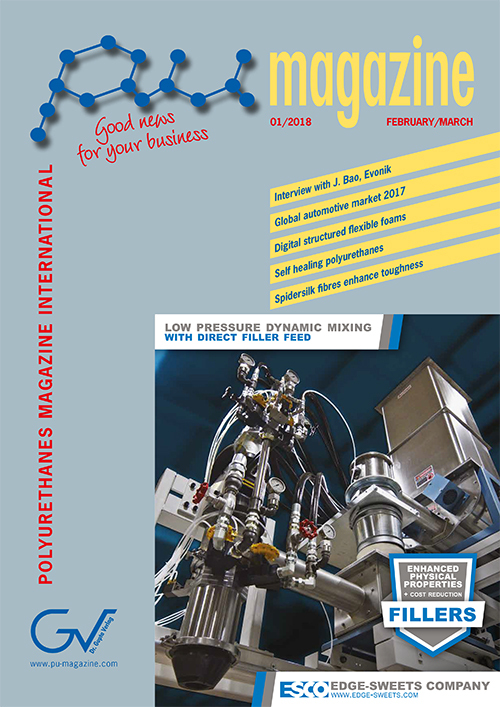 PU Magazine had the chance to speak to Dr. Thomas Roemer about his new role and the innovations in the TPU portfolio. “We are one!” - Tolerance and acceptance across borders – Interview with Andreas Fill, Managing Director and owner of Fill Gesellschaft m.b.H. On the fringes of the FSK Conference 2017 in Gurten, Austria, we had the opportunity to talk with Andreas Fill, CEO and owner of Fill ­Gesellschaft m.b.H. about the success story of his company. The answer to the question of how everything began and what in his view were the most important milestones in the company’s history are summarised separately. Giulio Bettio is the owner and CEO of Lattonedil spa Milano, one of the leading manufacturers of sandwich panels in Europe. The group is based in Carimate, a few kilometres away from Como and Milan, in the area of Brianza, Italy. The first company of the group was founded here in 1969, almost 50 years ago. Today, Lattonedil has ten production districts located throughout Europe: six in Italy, one in Germany, one in Spain, one in Bosnia and Herzegovina, and a new office is about to open in France. With an annual turnover of EUR 220 million (consolidated data for 2017) and a wide range of products, the group – whose products are also highly appreciated abroad – stands out in the Italian manufacturing industry. The site in Carimate, the headquarters of the group in the Seveso river valley, covers over 120,000 m2 (15,000 m2 of which roofed) occupied by three production lines, offices and external storage areas. The facility achieved a turnover of EUR 136 million in 2017. 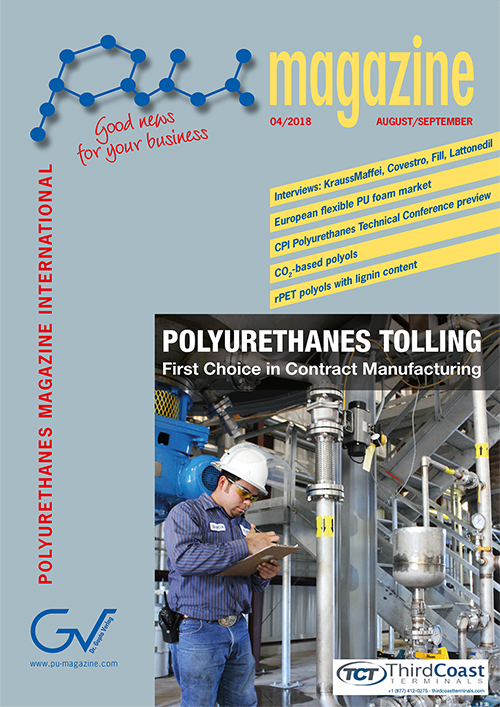 The commercial introduction of polyether polycarbonate polyols to the European flexible foam market has reached a new milestone end of 2016 with the inauguration of the production plant for CO2-based polyols. This paper presents the recent progress that has been accomplished on the development of these polyols and is a guide to formulations for conventional slabstock foam. Emphasis is placed on physical and emission properties of conventional foams. 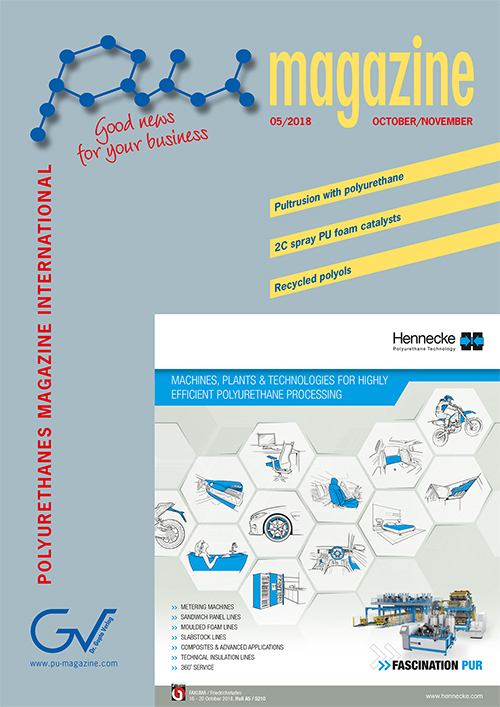 Moreover, the topic of sustainability of polyols is covered. Wood fiber insulation (WFI) boards are produced by bonding together wood fibers with polyurethane/polyurea-based binders. The presence of air gaps in-between the fibers results in materials with relatively low thermal conductivities with λ10 values of typically 35 – 50 mW/(m·K). In this work, we attempt to further improve WFI’s thermal insulation performance by using emulsifiable MDI (methylene diphenyl diisocyanate) as a binder. The findings will examine the synthesis and characterization of WFI products where air gaps have been partially filled with silica aerogel particles. Thermal conductivities as low as 18 mW/(m·K) were achieved, which represents a step-change not only compared to conventional WFI, but also compared to conventional closed-cell insulation foams, which typically have λ10 values above 20 mW/(m·K). Significant improvements in both mechanical and fire properties were also achieved. Halogenated flame retardant agents have protected the public from injury and death by helping to prevent fires in buildings and dwellings for many decades. Today, new flame retardant options are being sought that are based on green chemistry and that contain no halogens for use in rigid foam applications. Resinate Materials Group, Inc. has developed green-content aromatic polyester polyols that provide improved flame retardant performance in polyisocyanurate (PIR) insulating foams. 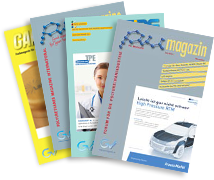 The green content of these new polyol products originates from biorenewable lignin and recycled polyethylene terephthalate. This paper details the performance of these emerging sustainable-content polyols in PIR foam applications.